Agriculture Sec. 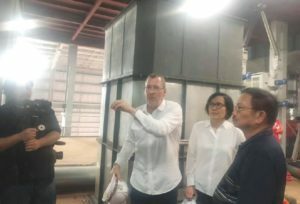 Emmanuel ‘Manny’ Piñol listened intently as couple Patrick and Rachelle Renucci of the ChinYi Agri explained to him how their rice processing complex, located in Alangalang, Leyte, works. ALANGALANG, Leyte – The Department of Agriculture will engage in a partnership a private company owned by a French-Filipino couple, who invested P1.7-B in a modern rice processing complex and farm machinery, to develop the rice industry of Leyte and the southern towns of Samar Island. Patrick Renucci, a French printing company owner, and his wife Rachelle Tan, daughter of a known Filipino-Chinese businessman, have agreed to work with the DA in implementing their dream of turning Leyte into one of the biggest rice production areas of the country. The couple, who decided to leave behind all their businesses in France and settle in Alangalang town right after “Typhoon Yolanda” in 2015 to help people recover from the devastation, said the support of the DA to their advocacy would complete their dream of improving the lives of the people of the province through increased rice production. Shortly after settling down in Alangalang town, the couple established a company called ChenYi Agri and purchased farm tractors, harvesters, transplanters, including laser-guided field levellers to develop the rice farms in Leyte. In 2016, they invested over P1-B for the construction of the most modern fully-automated rice processing complex in the country which they expect to be commissioned by President Rodrigo Duterte in January 2019. In the partnership arrangement which was agreed in principle during my visit to the Rice Processing Complex on Dec. 21, the DA will support ChenYi Agri by providing more farm equipment and extending loan assistance to farmers engaged by the company through a supervised loaning program. The Philippine Rice Research Institute (PhilRice) through its Executive Director Dr. Sailila Abdula will also support the program by providing high yielding seeds of good quality rice varieties. The Agricultural Training Institute (ATI) will also be brought in to conduct training for rice farmers to improve their farming technology. Currently, ChenYi extends loans for seeds at 0% interest to farmers in the area, fertilizers at very low interest rates and equipment and machinery services payable upon harvest. The company has 10 small tractors, several units of transplanters, 10 harvesters and trucks and intends to acquire more to hit their target of a production area of 2,000 hectares by 2019.